Not all of us can see in 3-D. This seems to be forgotten in every article I’ve seen on this so far. Erm, no. Some of us don’t have a choice: we can’t. This was also a minor issue for me looking at the three dimensional structure of molecules displayed on the earlier molecular graphics displays (in the late 1980s and early 1990s). 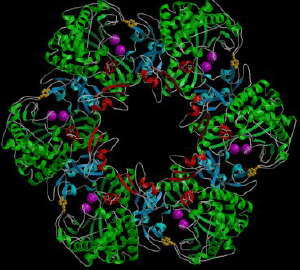 My background is analysing the sequence, structure and function of the “macromolecules of life”: DNA, RNA and proteins. I am particularly interested in the latter, especially those that interact with DNA to control the use of genes. Proteins have complex three-dimensional structures and are viewed using molecular graphics software like PyMol or Chimera (for what it’s worth I usually use Chimera). Stereo display systems on computers are usually equipped with stereo glasses. These typically alternately allow one eye to see the image, then then the other by blocking each eye in turn by “flooding” the LCD-based (liquid crystal display) lens. This is synchronised to the graphics card, which projects left- and right- images with the proper timing for your left eye to see only the “left” image and vice versa for your right eye. I’ll tell you about the early graphics molecular graphics systems I used some other time, but one problem you get seeing a complex 3-D image with only one eye and poor depth cuing is an inversion effect, where your brain inverts it’s perspective of the shading to effectively “invert” the image. A simple fix to was to slightly rock the image, so that the foreground moves in front of and with a greater travelling distance that things further back. It’s sometimes called “wiggle stereoscopy”. Similarly, animations of 3-D objects are helpful when giving talks for people unfamiliar with the shapes of the objects. Those studying them often forget it’s very hard to someone not familiar with a complex shape to quickly take it in presentations of it from new angles; it’s better to rotate to the new position if possible. Not to mention those that can’t see, those that become ill or get a severe headache watching 3D movies, those whose glasses prevent the correct placement of the 3D glasses (I’m in this category) and so on. Very sick of people raving about 3D so I’m glad you brought it up. I also have glasses, and they’d be a pain for wearing the 3-D glasses if I were able to use them so I know where you’re coming from! I imagine they’ll tackle the glasses issue in time as that’d be far too big a minority to ignore. In the meantime, what a pain, eh? What I am bothered by is people forgetting that a minority can’t use these things. As a silly example, I’d hate to have 3-D TVs foisted on us in the way that wide-screen format TVs are, by the TV channels only sending out that format. This post is very timely for me, as I watched Avatar last night. A silly plot but a *very* impressive visual experience, assisted greatly by the 3D effect. Unfortunately I’ve been having a bit of irritation from one of my contact lenses lately, but I put it back in to see the movie, which may not have been entirely wise, and it looks like I’ll have to give my left eye a rest for a day or 2. Being ocularly differently-abled myself, I have considerable sympathy for you, Grant, but that 3D is gorgeous! 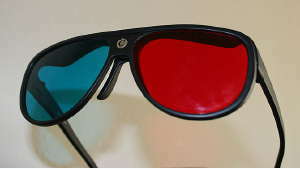 All this 3-D talk makes a guy that is blind in one eye want to sue claiming discrimmination. It gets worse. It’s in danger of going mainstream horribly. The rumour-mill has the next Bond movie, Clash of Titans (no idea what that is) will be in 3-D and rumour now the next Potter movies (both of them) to be in 3-D too.